Pour 350ml (12fl oz) of the chicken stock into a saucepan and add 50ml (1.7fl oz) water, the pearl barley and half a teaspoon of salt, bring to the boil, simmer 30 minutes until pearl barley is al dente. Heat the goose fat or butter in a large enough flameproof casserole to fit the pheasant which you have seasoned inside and out. Brown them lightly all over in the fat. Lift out using a slotted spoon and leave to cool a little then lay a bacon rasher over each breast. Heat the oven to 220ºC/fan 200ºC/gas 7. Add the shallots to the pan and brown, then add the rest of the vegetables, rosemary, ½ tsp salt and freshly ground black pepper. Cover and cook over medium heat for 10 minutes stirring occasionally. Add the bay leaves, juniper berries, cooked pearl barley, Marsala or whatever and the rest of the chicken stock. 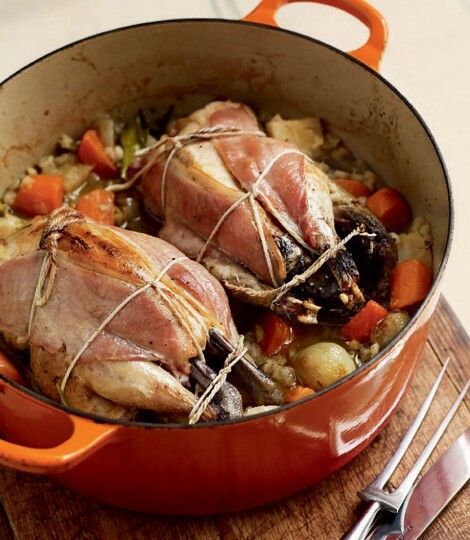 Place the pheasants on top, bring it all to the boil on a high heat then transfer to the oven where it cooks for 20 minutes with the lid on. Remove the lid and cook for 10 minutes more. Remove from the oven and leave to rest for 5 minutes. Lift out the pheasants ready to carve. Season the vegetables and place on plates, carve off breast of pheasant and cut off the legs. Serve on the vegetable bed with the juices. What an incredible-sounding recipe!garlic, yum! Beautiful photography too, love the lighting and the food styling is superb. The cleaning is the challenging part... when we were home, we used to keep making this and I used to eat most of it... looks delicious..